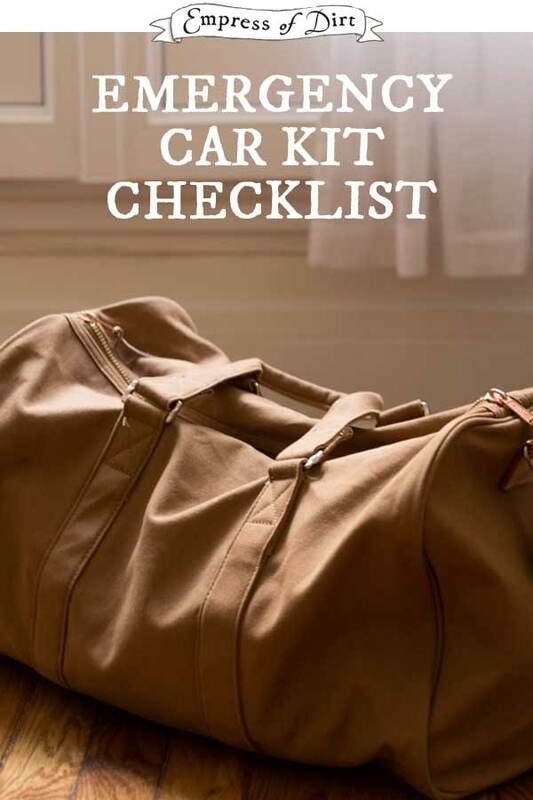 Emergency car kits can be lifesavers in the event of an evacuation, or breakdown while travelling. 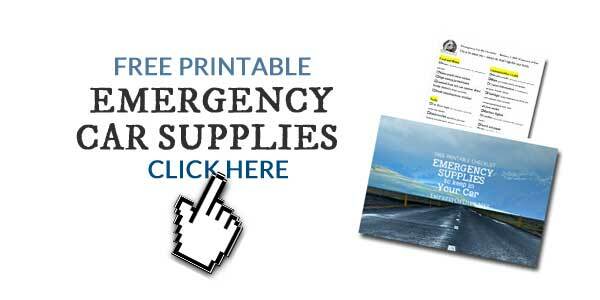 We may never need them, but, if we do, you will be so thankful you were prepared. I’ll walk you through a list of considerations. Pick and choose what you feel is necessary for your family. For more handy checklists, see Organization Tips. I started carrying an emergency car kit from the time I first started driving. There’s a powerful feeling when you get that first taste of freedom, travelling to places you could never reach before with public transit. But there’s also a feeling of vulnerability, particularly in more remote areas. What if something went wrong? What if the car broke down? What if I was stranded? To decrease the anxiety, I learned some basic car repairs, and stocked my car with basic tools, how-to manuals (in those days it was Auto Repair for Dummies), and some non-perishable necessities. Just in case. Most often I end up using these supplies to help others. 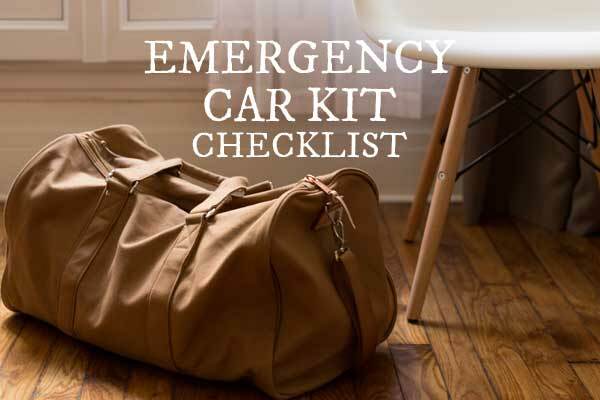 Consider the car emergency kit as a resource both for unexpected events while driving as well as a resource for fleeing from or getting called to an urgent situation. No matter where I’m going, I feel better knowing I have some supplies with me (food, water, light, warmth, communication devices). We witnessed a real eye-opening event a few years ago. A massive snowstorm descended on our region (Ontario, Canada). According to the weather records, it snowed continuously for 100 hours, stopped briefly, and then snowed for another 9 hours. That included a total of 33 hours of blizzard (complete whiteout) conditions. Hundreds of motorists were stranded on highways and rural roads with few or no emergency supplies. It took days for rescuers to reach everyone. And you can bet that very few had any basic supplies in their cars. Granted, it was an epic storm (with nothing comparable on record), and, if we’re lucky we won’t see another one like it, but on a smaller scale these urgent situations happen every day. Storms, accidents, breakdowns. You just never know. While the list here is aimed at stuff to keep in your car for emergency situations, if you have to evacuate and leave by car, family members and pets come first. Do you keep pet carriers in a handy location? What about extra pet food, water, a blanket, and medications (if you pet needs any)? 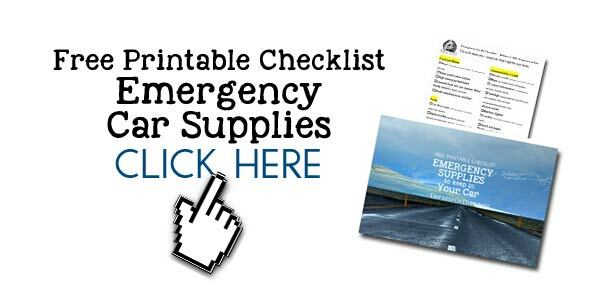 With all of the natural disasters and other emergency situations that go on in this crazy world, it’s worth thinking through various scenerios and making preparations. If an event occurs, it’s still going to be messy and emotional and challenging. But, much more managable with urgent supplies on hand. 1. Determine which items you want to put in your car. And don’t wait until you have them all. Something is better than nothing. Jumper cables, hand crank radios, and first aid kits are great to have, but it’s even better if you know how to use them. 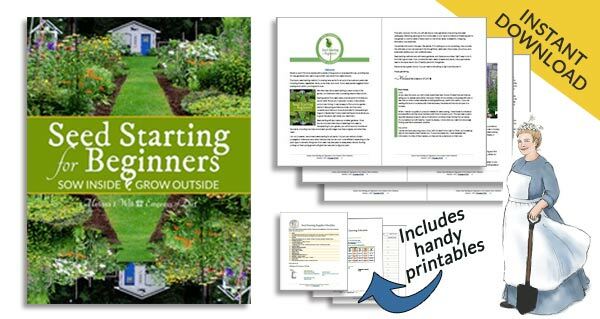 Get familiar with everything and include instruction sheets in your kit. And yes, some of the items listed here might seem a little dramatic (or too big to stash). But most take up little room and would be really nice to have in a crisis. Plus, this kit can also act as a backup for your home in the event of long power outages or other problems. 4. Keep your kit up to date. Every spring and fall I take the emergency supplies out of the car, change out the items that need refreshing (including water and batteries), and make sure nothing is missing (hungry passengers have been known to gobble up protein bars). I also re-check the supplies when we’re going on longer trips or plan to drive through rural areas (with few resources or inhabitants). Where you live/drive and the situations that may arise. Amount of space available in the car. How cautious you like to be. This topic is huge and there is no way I can cover every scenerio. Look over the suggestions (below) and consider what you want to prepare for your family. Safety note: Many injuries during car collisions are actually caused by loose items in the car hitting the passengers. Wherever you keep your supplies, be sure they are tied down securely. Do your homework. I’ve linked to product ideas below. Be sure to research what is best for your situation. Water. I use stainless steel bottles. If you use plastic bottles, change them out frequently. Recommended amount is 2 liters of water per person per day. Water purification tablets (see them here). High energy protein bars (not high salt/sugar granola bars). See some options here. Canned food and can opener, dried foods (stored in Mylar pouches). Small camping stove and fuel. Weather radio (battery or hand cranked). Maps (on mobile phone and paper). Contact information – emergency services, friends, family. Flashlight (keep batteries out of the unit until needed). Also consider rechargeable/handcrank units. Candles (and safe container for burning them). USB mobile charger (there are portable and hand-cranked ones). Seat belt cutter or window breaker. See them here. First aid kit (gauze, bandages, latex/nitrile gloves, scissors, pain meds…). Hazard triangle (like these ones). Road flares (to attract attention to your location). Prescription medications, infant formula or equipment for people with disabilities. Extra clothes including hoodie, socks, hat, mitts, waterproof footwear. Paper towels – stash extra plastic bags inside tube. Tarp (for shelter) or vinyl tablecloth (for protection or laying under car). Reflective vest and/or tape. See it here. Toilet paper, Shewee, travel john. Bag to stash waste. Backpack to carry kit if you must leave car. Car floor rugs can be used to provide under-tire traction. Basic tool kit (be sure to research what’s best for your car). Options include pliers, wrench, screwdriver, wire cutter, ratchet sockets, hex keys…. Tire gauge, work gloves, WD-40, and other fluids your car uses including antifreeze, brake fluid, and funnel. Spare tire, tire changing tools, tire inflator, repair foam, or sealer. Portable compressor (some use the car charger). See examples here. Jumper cables (6-gauge) and instructions on how to use them. Gas can. Extra oil if your car tends to need it. What did I forget? What else would you include? Plan Ahead for Disasters | Floods, hurricanes, extreme heat. I have lived a life from farmer to soldier then lawyer. Always sought loyalty justice and riches. Now retired after 56 so built a house in six acre field .Took five years to build my garden landscaped English. Good to read some of your stories so will stay alert for more. Not that I use many but its a good read anyway.